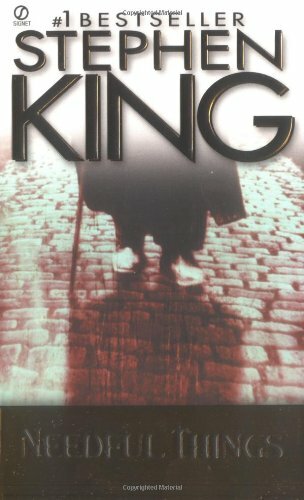 What's the Difference between Needful Things the Book and Needful Things the Movie? Mr. Gaunt and Alan Pangborn meet at the climax of the story as Gaunt takes care to avoid meeting the sheriff. They meet on the first day the store opens. John "Ace" Merill was Gaunt's helper. Danforth Keeton is the helper. Gaunt's first customer, Brian Rusk kills himself. He tries but doesn't succeed. Polly Chalmers runs a sewing shop. Being a seamstress has caused her arthritis. She owns the local diner. Polly breaks the necklace and then has to fight the growing spider. She throws the necklace down.